All good journeys start somewhere. There is always a beginning. There is always the place where it all starts. The place where the journey starts may be amazing. It may be mundane. It may be glamorous. It may be dour. It may be exciting and adventurous. Or it may be Swindon. We’d gone to Swindon so we could start walking the Ridgeway, a National Trail that follows the absolutely ancient former “green” road known as The Ridge Way. In use for at least 5000 years, it was once an important route for tradesman, armies and drovers, connecting the Dorset coast with the Wash in Norfolk. It’s modern route is just a bit shorter the original 400 mile one. The National Trail was opened in 1973 and provides a route for walkers connecting Overton Hill in Wiltshire with Ivinghoe Beacon in Buckinghamshire; an 87 mile route with ancient forts, barrows, monuments and more. It’s a walk with history, providing an idea of how their ancestors got around, and at what speed. But it must it said, that it doesn’t go to Swindon. Swindon is most certainly not on the Ridgeway, either in its original or modern capacity. 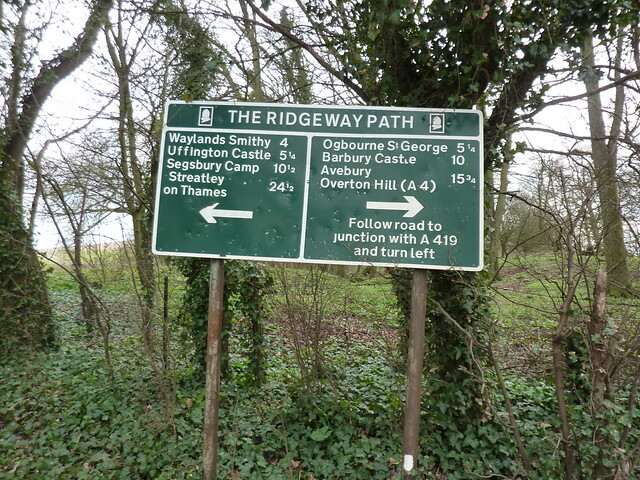 However the start of the Ridgeway National Trail is in the middle of nowhere. The nearest village is Avebury, three miles away; best known for its henge and long barrow. Avebury is a bus ride away from Swindon and where we’d hoped to stay the night. It would be fantastic, we thought as we phoned the first B&B on our list. “20 March? Is that the equinox?” asked the lady at the other end of the telephone. “I’ve absolutely no idea” I confessed. I just wanted to do some walking. Equinox? Meant nothing to me. We’d just picked the only time Catherine and I could get a few days away. The Equinox was the last thing on our minds. Prior to arriving in Swindon I knew just two things about it. One was that a friend of a friend’s sister lived there (although I couldn’t for the life of me remember which friend it was.) The second was that it was home to the “Magic Roundabout” – a series of mini roundabouts, all arranged in circle. Neither of these two facts particularly inspired particularly. Photo by ZapTheDingbat. Creative Commons licensed. The view of Swindon as you arrive on the train doesn’t exactly inspire either. A series of 1960s tower blocks, many housing hotels, dominate the skyline, whilst a dual carriageway lined with bus stops takes the traffic away. We headed to our appointed tower block, passing through a corner rather dreary looking 1960s shopping centre, checked in threw our packs in a corner of the room. The hotel’s in-room brochure helpfully showed a series of local tourist attractions which consisted of a railway museum (how could I forget that Swindon was once home to the GWR’s railway works), a heritage railway, an outlet shopping mall and a maze made out of maize. None of which would be particularly good at 5pm on a Sunday evening. A trip to the pub seemed the obvious solution. There must be a nice part of Swindon, we thought as we wandered a little more through the empty shopping centre, passing what must have be the alcohol zone. Bars lined the streets; the kind which thrive on a Friday night, cramming the punters in, turning the music up load and trying to get the customer to consume as much as possible. Clearly Swindon’s bar scene was not thriving. For every open bar, another was boarded up. Several of those still in business didn’t seem to be thriving, with peeling paintwork or large “LEASE THIS PUB” signs. Only Wetherspoons seemed to be thriving. Finally managing to escape the shopping district, we found ourselves walking along a busy road. Spying a pub in the distance we wandered down, only to look through the window to see it housing more pool tables than tables. Crossing over and entering a row of stone terrace houses, we found two more pubs with little to entice us in. One, an Irish pub, had a large set of speakers and disco lights on at 6pm. In despair we headed back to town. Photo by Matthew Black. Creative Commons licensed. A parked up police car turned on its lights, its siren blazing away as it pulled out, revealing yet another hostelry. Glumly trudging up to it, our heavy hearts were quickly lifted. 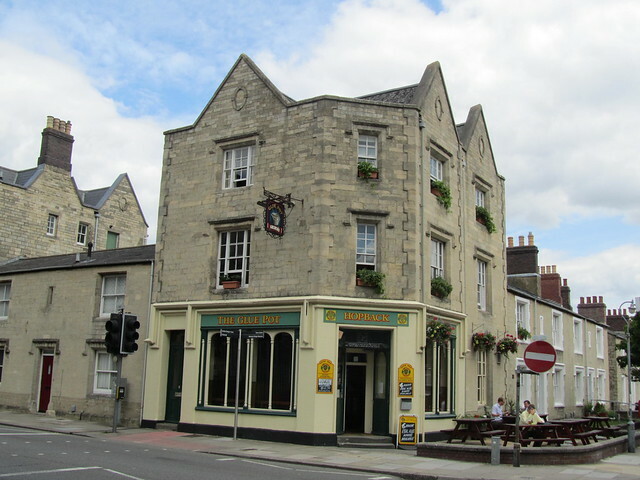 Looking through its windows, it seemed we’d found the one decent pub in Swindon. The Gluepot‘s single room was wonderfully broken up by tall wooden booths, whilst the eight handpulls on the bar glistened brightly, with the beer dispensed by a friendly barman. If there’s one thing our travels hadn’t turned up much of, it was restaurants and the barman couldn’t help much on that front either, informing us that there wasn’t much beyond a very good Italian, and two Indian restaurants. Sited nearby each other, one restaurant proclaimed itself to be the preferred curry house of the local MP. Swindon frankly couldn’t get better recommendation than that. Aby’s Indian Experience it was for a curry and a half, whilst Bollywood videos played on a large wall mounted TV to a near empty restaurant. First Published: 25 April 2011. Last Updated: 16 November 2014.